Q: How do I overwinter my tropical lilies? 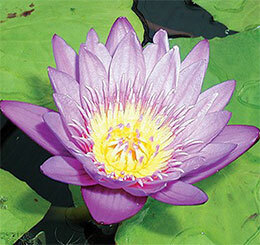 A: Vivid and fragrant, tropical water lilies are the floating jewels of a pond. If you live in Hardiness Zone 9 or lower, you’ll need to take extra special care of these warm-weather-loving beauties over the cold season. To overwinter tropical water lilies, you have two choices: send them into dormancy or keep them growing. First, remove the lily and planting basket from the pond. Using your hands, dig around in the soil just below the plant’s crown to feel for the tubers. They normally range in size from an acorn to golf ball, but they can be smaller or larger. Take out the tubers and rinse each one very well with a strong stream of water. Use your pond scissors to trim off remnants of roots or stems. If small tubers are growing on a larger tuber, remove them and store them—they could turn into new lilies plants next year! Store the tubers in a plastic bag or glass jar that’s filled with damp (not wet!) peat moss, sphagnum moss or sand. Consider dusting them with a fungicide before sealing them up. Keep the container in a room that stays warmer than 50° F.
Once a month through the winter, check on your tubers to be sure they’re still damp. Spritz them with water if they get dry. When water temperatures climb back to 60° F in the spring, replant the tubers in a planting basket filled with fresh, fertile soil. Position them just below the surface with the pointy side up and round side down. First, trim off the largest leaves and any dead, dry or damaged leaves with your pond scissors. Place the planting baskets and plants inside in an aquarium or lined pond filled with water. Keep the water temperature above 60° F, and use a grow light to keep the lilies growing slowly over the winter. Once the weather outside warms and your pond’s water temperature climbs back to 60° F, transplant your lilies or add some fertilizer to their existing soil and submerge them. Overwintering tropical water lilies isn’t hard, but it does require some space and planning. Good luck! Pond Talk: What tips can you share for overwintering tropical water lilies?